Today a ride to the west coast. Along the way a change from pasture lands to forests with hills along the way. Last night watched some of the election results. The results were largely a repeat of status quo with few seats changing and the liberal/national coalition still in power for a third term. The Greens party did particularly well (especially in Tasmania), in part as protest against major parties stance on asylum seekers. Had brekky in Burnie before departure. From Burnie there are two choices of route: A10 is 70 km and much steeper than B18 that is 59 km and is along the railway for part of the way. However, first 4 km from Burnie was a nice steep hill. The initial route went past small farms with cows, goats and some sheep. Mostly clear skies with temperatures of 3°C. Apparently frost above 500m. Stopped briefly at 13 km in Ridgley and again at 19 km in Highclere. Highclere had sign of "last food and fuel for 100 km", though that meant Tullah, so not quite 100 km. Hampshire was at 30 km and after that mostly forests. Large trucks passing with name "Chas Kelley" kept passing. I'm told they go seven days a week between wood chip mill and the port in Burnie. Log trucks go only five days per week, so I didn't see any today. After 30 km, the route was also more variable instead of always climbing. By 40 km mark, skies had clouded over and I now had rain showers. At 56 km was road junction with the longer steeper road. I had a brief period of hail here, but fortunately not too big. Also at this point started 8 km of roadwork. Most was fine, but two sections were gravel and thus ended up with some muddy road to ride through. 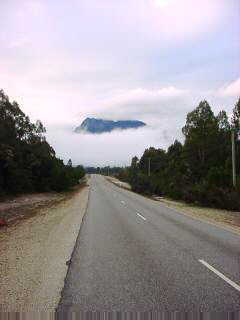 At 73 km was a turnoff to Cradle Mountain. At 78 km I stopped briefly at a sign, "Highest Point on the Murchison Highway - 690m". Nice to have climbed this much even with the occasional descents. From here the last 18 km did have more downhill before reaching Tullah. Tullah is at 180m elevation and has population 250. Nicely situated on a lake. There was a small cafe next to the post office. After waiting for a bit for late lunch, decided this would be a nice place to stay. 96 km today, 22290 km cumulative. Today a beautiful ride in the west and a little more Tasmanian history. Started with cool misty skies. It was flat for five km but then quickly changed with a four km climb over Mount Black. Giant ferns nestled amongst the trees along the way. After winding to top of the hill, a quick descent to Rosebery at 14 km. Rosebery is a mining town with copper and lead/zinc mines. A nice bakery in middle of town. After Rosebery still some hills though smaller than Mount Black. At 28 km I came past Renison Bell, which claims to be one of the worlds largest underground tin mines. At 36 km was a turnoff and 6 km later I came to Zeehan. Zeehan was named for one of Abel Tasman's ships. Abel Tasman was a Dutch explorer who in 1642 came around Tasmania with two ships, the Zeehaen and the Heemskirk. They sighted and named two peaks for those ships. Tasman named the area Van Diemens Land for the Dutch Governer of the East Indies but otherwise didn't find much in the land. I followed up further on Zeehan history at the Pioneer Museum downtown. In 1882, Frank Long discovered Galena, lead/silver ores. Mining started slowly, but in the 1890s it boomed and Zeehan, the Silver City, was the center. At 1900 Zeehan had over 5000 residents and was third largest city in Tasmania. The museum had good displays particularly of the early 1900s when Zeehan was at its peak. Eventually the mines closed one by one and with them much of the town. From Zeehan there is a back route to Strahan. This route goes along an old railway route, so it winds back and forth but was flatter than in the morning. Nice riding with shrubs and trees along the way. The route briefly went along the beach before coming to Strahan. Strahan is a touristy town on Macquarie Harbour. I found a place in downtown for two nights. I also booked a day cruise tomorrow to see local sights. One of these sights is Sarah Island. I'll explain more tomorrow but here is a quick summary. In early 1800s, some 175,000 people were transported to Australia as convicts. Sarah Island was established in 1822 as a secondary prison for those committing crimes in Australia. Prisoners worked at hard manual labor including shipbuilding. This prison was closed in 1833 in favor of Port Arthur on the east coast closer to Hobart. In the last days of the penal settlement, ten prisoners made their escape by capturing and completing the brig Frederick and sailing her 10,000 miles to Chile. At the info center I attended a play, "The Ship that Never Was". This was a reenactment of the Frederick story and included audience participation. It was fun. The title refers to the legal loophole that it couldn't be piracy since the ship was never commissioned. 85 km today, 22375 km cumulative. Today a cruise on Macquarie Harbor and the Gordon River with Wilderness Heritage Tours. I'm at the "roaring forties" latitudes with frequent winds and storms and no land to the west until at least Africa. Winds of 40-50 knots are frequent here. Rainfall is among the purest in the world. There are only two safe anchorages on the west coast. One at Port Davey, the other is Macquarie Harbor. The harbor is ~300 km2 or about twice the size of Sydney Harbor. There is a narrow entrance about 80m wide and 20m deep. It was named Gates of Hell by early prisoners and is now "Hells Gates". Inside the Hells Gates were sand bars and a shifting shallow channel about 2m deep. A rock barrier was built to keep the channel in place and also deepen the channel to 7m. This still limits ships to ~2000 tons so mining ores are hauled out to Burnie via road and rail. The harbor and nearby rivers are strained brown by tannin from plants. In the harbor are four fish farms. Atlantic salmon and ocean trout are raised to fingerling size in hatcheries and then put within large nets in the harbor. We stopped at Sarah Island for a tour of the formal penal settlement. Until 1818, Tasmania was primarily a place of secondary punishment for those sent on from Sydney. After 1818, it was decided to send convicts directly from England to satisfy increased demand for convict servants. This meant new areas needed to be established to keep reconvicted men separate from new arrivals. Sarah Island was set up to hold those reconvicted prisoners. Sarah Island was chosen because its isolation on the west coast would make escape difficult and labor could harvest huon pine for ships. The first convicts were assigned to clear Sarah Island of all trees. Winds and gales forced them to soon build a fence around the island as a windbreak (oops). Now the trees have grown back. Bricks from a few of the buildings are all that remain. On average 250 convicts were held at Sarah Island with a peak of 550. It was a brutal camp. There were about 180 escape attempts with ~20% of them successful. Getting off the island wasn't difficult but surrounding terrain and vegetation difficult to cross. The most successful escapes were by boat rather than overland. In 1828 over 8000 lashes with a cat-o-nine-tails were administered to about 200 convicts. To some extent the brutal reputation was also supposed to serve as a deterrent. In 1829 about 800 lashes were administered. What changed was a dramatic murder and much increased shipbuilding under a new shipwright David Hoy. Between 1828 and 1833 ninety-six boats were built. Convict labor was in demand to build good ships and they were treated better. Escapes only increased after it was announced that Port Arthur would replace Sarah Island in 1834. The last escape was of ten prisoners aboard the Frederick. Our boat sailed up a short stretch of the Gordon River and stopped to view the temperate rainforest. This river gained notoriety in 1981 when work was started for a giant hydroelectric dam. The dam in this wilderness area caused considerable controversy and a much expanded environmental movement in Australia. Over 1300 were arrested, pretty amazing for such a remote location. The environmentalists prevailed and in 1982 a large part of Southwest Tasmania was listed as a world heritage area. It is one of the largest and last areas of temperate rainforest in the world. Huon pines grow here up to 4000 years old. The area has annual rainfall of three to four meters with rain falling on at least 300 days per year. Tasmania still had highest percentages of voting for Greens in the recent elections. Our boat came back to Strahan around 3 pm. Looked around town a bit more including laundry and internet cafe. Topographic maps I've seen indicate some steep hills ahead. 0 km today, 22375 km cumulative. A short ride today and time to explore a bit of Queenstown. The hills were steeper than before but not as bad as I'd expected. It started with a short climb from foreshore in Strahan and had some winding hills after that. Mostly forests with occasional giant tree ferns. Along the way, I saw 13 small Datsun 2000 convertibles on a two week trip through Tasmania. Light rain for most of the ride. A nice overlook to Queenstown. Much of the vegetation is gone from the hills. Deforestation is result of logging followed by heavy sulpher dioxide emissions from a former smelter. Queenstown has population 3000 and is a mining town. Main streets look much less touristy than Strahan and more of a working mining town. I found a place to stay and then went off in tourist mode. I went on a two and a half hour underground mine tour of the Mount Lyell Copper Mine. This is a working mine that employs ~300 people and brings out 2.5 million tons of ore per year. This ore is 1.25% copper with traces of gold and silver. Four of us on tour put on lots of safety gear: helmets, lamps, safety vests, boots and carried an emergency ventilator. We boarded a 4WD vehicle and were driven 6.5 km into the mine at an elevation of 200m below sea level (440m below the surface). The heavy newest blasting occurs 200m further down. The tunnels are through hard rock and don't need extra bracing. The tunnels follow seams of rich copper and are made large enough for heavy equipment. Below ground the ore is crushed to 15 cm size and put on conveyor belts to the surface. On the surface the ore is further crushed and chemically separated. It is then trucked to a nearby railway depot and then taking via train to Burnie. The mine operated 24x7 with miners on 12 hour shifts. We walked through the tunnels, saw the crushers and below ground mechanical shops. It was interesting to see this mine. In the afternoon I took a two and half hour ride on the ABT Wilderness Railway. The railway is a re-creation of the 1895 railway with steam engine and a few passenger cars. Eventually the tracks will be reopened along the 1895 route from Queenstown to Strahan. So far one can travel ~13 km to Rinadeena at top of a high hill. Walked around town and saw some of Queenstown. Also fixed a flat front tire that seemed to be caused by a cracked glueless patch. Seems like normal patches might still work better long term. 40 km today, 22415 km cumulative. A nice ride crossing over rugged terrain today. Several long hills with tops at 5 km, 31 km, 51 km and 70 km. It started with Gormanston Hill right out of Queenstown. The road wound itself along the mostly barren hill with Queenstown visible below. Fun to see the twists and turns in the road. Just past the top were some houses from Gormanston settlement followed by a nice downhill toward Lake Burbury. Here drizzle today, particularly where the road climbed into the clouds. At 26 km I passed signs indicating Franklin-Gordon Wild Rivers National Park. This is also a World Heritage Area with rafting and bushwalking being popular activities. In the next 50 km, I passed several trailheads. At 28 km and first of these trailheads, I met up with the Datsun 2000 group again. Slow steady climb to Victoria Pass (530m) at 31 km followed by ride through several meadows and another climb to hill at 51 km. The road wound around Mount Arrowsmith to a pass at King William Saddle at 70 km. Signs indicated King William Saddle was a dividing point between east and west. After this point it became drier with eucalyptus and grasses instead of rainforest with tree farms. A slight descent from King William Saddle but mostly flat as I left the Franklin-Gordon National Park and reached Derwent Bridge for a late lunch. A nice wilderness hotel here. Made it an early day with a weak front expected to pass through and otherwise reasonable spot for two easy days riding to Hobart. Not much in Derwent Bridge other than the hotel and a petrol station. About 5 km to the north is Lake Saint Clair with fishing and lakeside cabins. Lodge has a nice fireplace which is welcome since high temperature not much above 15°C since I've been in Tassie and that we're at 740m. 86 km today, 22501 km cumulative. Three crossings of the Nive River today with good descents and ascents. It started as a cool morning with thermometer reading -3°C. After 11 km I stopped to put on sweats over my shorts, brr. Initially fairly flat with occasional slight hill. This area had several canals and lakes. Wattle grubs are for sale, presumably for fisherman. At 25 km was the first crossing of Nive River with a short descent, one lane bridge and a climb up the other side. At 26 km was a turnoff to Bronte and at 35 km I came past lake Binney. I had descended just 90m in the first 35 km. At 40 km, the road started a much quicker descent. Hooray I thought as I went downhill and through two hair-pin turns. At the bottom were two hydroelectric power stations with large supply pipes coming from above. An extensive network of lakes and hydro plants have been built in Tasmania. During the 1960s and 1970s these were nicknamed "white coal". The theory was that plentiful cheap power would help Tasmania attract industrial jobs and reduce unemployment that was otherwise higher than other states. Building of dams and hydro plants continued until Franklin-Gordon dam controversy in 1982 changed the overall direction. I noticed in newspapers that there is now a "Basslink" project underway that looks like it is attaching Tasmania to the national electric grid via cables under the Bass Strait. Presumption is that Tasmania is still usually a net exporter of power. After descending the Nive River at 46 km, I realized I would now need to slowly climb back up the other side. A slow climb brought me up to Tarraleah at top of the gorge and 51 km. Tarraleah was a very quiet town. The petrol station barely had any drinks or other stuff. There was a nice overlook here down on the power station. From Tarraleah I followed giant water pipes out of town and then along some canals. At 58 km I met Trevor from Melbourne who was cycling through Tassie for a few weeks. We traded useful info about hills and towns ahead. At 66 km I descended and came to the Nive River for a third time. Another slow climb and then ups and downs until I reached Ouse at 87 km. Ouse had much more stores and shops than Tarraleah and was place for a late lunch. Reasonably flat from there to Hamilton. Hamilton had signs for historic town and listings for several B&Bs all with "no vacancy" signs. Found a place at the historic inn and relaxed for the day. Overall a good portion of hills today, particularly to and from the Nive River. 102 km today, 22603 km cumulative. Ouse rhymes with "snooze" and not "house"
Today an easy ride and attempt to beat a coming cold front to Hobart. Nice stay at the historic 1834 inn last night. Leaving Hamilton the road climbed for first 4 km and then descended after that to Gretna at 21 km. Pastures with many sheep today. Once again any sheep closer than 20m to the road would spot the bicycle and quickly run away, frequently causing a stampede with their mates. Gretna had a nice old hotel and small post office. A short steep hill followed, but after that the road reached the Derwent River and became flatter. Coming into New Norfolk at 38 km, several crossings of railroad tracks at dangerous angles. At New Norfolk itself, crossed the river and followed the south bank. At 53 km was another bridge at Bridgewater. 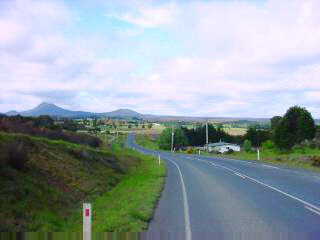 This is also where the main Hobart-Launceston road joined. Rather than follow the highway, I took a smaller road via Granton and Claremont. In Claremont were signs I followed off route to the Cadbury factory. I had seen signs for tours, but unfortunately found out these were only weekdays, so back to the main road. South of Claremont I got back on the main road into Hobart, passing Glenorchy with its eel waters. Climbed over a hill and I was downtown at the tourist info center. Hooray! Hobart is the seventh state/territory capital I've ridden through. The only one missing is Canberra, the national capital located in the Australian Capital Territory (ACT, somewhat like the US has a separate District of Columbia. One difference in Australia is the capital cities are the largest cities in each state, unlike the US where this holds only about half the time). Found a hotel downtown and booked for two nights. It was early enough that I caught tail end of the Christmas pageant parade including Santa riding past on a float. Walked around the pedestrian mall. Saturday is outdoor market day at Salmanaca Place, so walked through the markets. Otherwise walked through a bit of Hobart. Later in the afternoon more rain showers from the cold front. Expected to continue tomorrow and even snow at higher elevations (e.g. at Derwent Bridge where I was two nights before). 76 km today, 22679 km cumulative. There is a saying that Melbourne can have four seasons in a day. Seemed like Hobart had all seasons but summer today as temperatures didn't get over 10°C. In the morning a heavy cold rain that had me happy I wasn't riding. Cold gusty breezes with occasional showers during the rest of the day. Snow fell on Mount Wellington and was visible when it cleared in the afternoon. A good day for indoor activities. I saw the Tasmanian Museum and Art Gallery and the Maritime Museum. Checked an internet cafe and saw a film. Also walked a bit around the city. On Sundays during the summer there are markets at the waterfront. I stopped by, but many less stalls than on Saturday at Salamanca Place. The fire department also had demonstrations of rappelling from a nearby building. This year is the 100th anniversary of the Federation of Australia and today was port festival as part of the centenary. Fire department displays were part of this event. At nearby docks, the quarantine department, customs department and fruit growers had their info stalls as well. At the Antarctic Museum there was a 1970s furniture display that somehow seemed out of place with a dozen funky pieces. I was actually looking for the Antarctic vehicles but didn't see them. Today there was also a dedication of a plaque for the 46 who lost lives on the HMAS Sydney sixty years ago off Western Australia (see here for previous discussion of the HMAS Sydney). I skipped the 10:30am dedication which would have been cold and miserable but found the plaque later. Also skipped the Point to Pinnacle running race to top of Mount Wellington which would have been quite cold (and actually didn't go all the way to the summit today because hail and snow closed the road, 1200 racers still participated). The Maritime Museum was a good display of shipping that played important roles in Hobart history: whaling, timber, ferries, lighthouses, etc. I found it interesting that it took ten years after Sydney was established (1788) until 1798 when explorers Bass and Flinders confirmed Tasmania was an island. After that point, ships could travel the Bass Strait rather than going all the way around Tasmania. In 1804 Hobart was established becoming the second town in Australia. Boat transport was at least as important as roads for transporting timber and produce in the new colony. Sailboats are still a big event here with Sydney to Hobart race an annual event around boxing day. The Tasmanian Museum was free and at least as interesting as the Maritime Museum. It had a mixture with a little of everything: flora & fauna, minerals, convict history, paintings, photographs, modern art, history, etc. One of the interesting exhibits was of the "kangaroo stamp controversy". After 1901 when Australia became a nation, each of the states still issued their own stamps. It took until 1911 for a competition to be held to choose a design for a new Australian stamp. A contest was held, though it was decided to set aside the winners and design a new stamp. The new stamp contained an outline of Australia with a kangaroo in the middle and was issued in 1913. The kangaroo stamp caused a big fuss since convention had been to have King George V on stamps from commonwealth countries, not a kangaroo! (Early sentiment for a republic?) The government changed in 1913 and the new government also chose a new design, this one with the king. My current Australian stamps don't have the British Queen though she does appear on my Australian coins. Hobart is a nice city for walking around and today was a good rest day to get out of worst of the weather. 0 km today, 22679 km cumulative. Bike accident today, all is ok. A nice though hilly ride to Port Arthur. Last night the meteor shower would have been covered by clouds. In any case, I slept in to 5:15am and left after sunrise. Took the main road back out of Hobart. There is a tall bridge to the east shore. The bridge has a narrow one meter wide pedestrian/bicycle path on each side. I decided I would walk my bike over the bridge since the path was narrow and steep. I took the right (Hobart) side since there wasn't an obvious way to get on the left side, so against auto traffic. I was barely started walking my bike when a cyclist came zooming down the other direction. He wasn't looking and was going too fast to stop. Pow! In an instant we were both down, with my bike knocked over and glasses sent flying. Quick assessment time...my left knee was scraped and right elbow had come down hard, otherwise a scrape or two around the ankles. The bike looked ok, with the internal frame to my handle bar bag busted and my left pannier half knocked off. The cyclist had blood above his chin, but seemed fine. We dusted things off and I continued walking the rest of the bridge. A cycling accident, though technically I was a pedestrian. I took back roads through Rosny Park before getting back on the main highway. Until the airport at 16 km it was two lanes each way, with an ok shoulder. Most traffic was the other direction, inbound to Hobart. At 26 km was Sorell and turnoff to the Tasman Peninsula. Port Arthur had been one of my favorite places during my previous trip. Intriguing history and beautiful scenery. Overcast skies with occasional drizzle as I rode over the hills. At 48 km was Copping with a small store. The owner asked if I had been there before, remembering me from two years ago. Also at Copping I tried reseating my back tire since it seemed to be rubbing slightly...worked partially, though still a problem at end of the day. At 58 km was Dunalley with small canal dug around 1900. At 76 km was Eaglehawk Neck at bottom of a large hill. The land narrows to 100m at start of the Tasman Peninsula. A line of dogs was placed here to alert officials of escapes. At 96 km I came to Port Arthur, yeah! It was 2 pm so I found place to stay...two motels full, but room at the youth hostel. Afterwards I went to explore Port Arthur. Port Arthur was a secondary prison established in 1830. Between 1619 and 1875 the British transported a quarter of a million convicts to American Colonies (80,000), New South Wales (80,000), Tasmania (69,000), Victoria (3,000), Western Australia (9,700), Bermuda (9,000) and Gibraltar (9,000). Some would be classified as criminals by todays standards, but many also included lesser crimes such as picking apples from a tree. When sent to Australia, some were assigned to settlers, some to road parties, some skilled to their trades as blacksmiths, sailors, etc. They would serve terms of 7 years, 14 years or life with potential "ticket of leave" granting them freedom sooner (though not right to get back to the British Isles). If a convict had further problems in Australia, then Port Arthur was one place they might be sent. Reasons for being sent to Port Arthur included: absconding from work (22%), stealing (21%), boys too young to be assigned and placed in Port Arthur (25%), crimes of violence, plotting mutiny or refusing work (21%), not formally charged or guilty (6%) or being drunkards (5%). Port Arthur was a tough prison with physical punishments and also later solitary confinements. Some of the old buildings were still standing so walked through the old penitentiary, church, soldiers quarters, etc. Also at Port Arthur was a memorial to people killed in Australia's worst mass murder on April 28, 1996. Overall an interesting place to walk around and visit again. This time I skipped the evening "Ghost Tours" of the ruins. However, they are fun and worthwhile. 96 km today, 22775 km cumulative. A few longer hills today. This was the fourth time I had ridden the first 71 km from Port Arthur to Sorell, twice each direction. Still haven't had enough of the scenery. There are a nice sequence of stops about each 10 km and I took it slow with many stops. Mainly pasture lands with sheep and a few cows. Nice hills and vistas. First stop was the Convict Country Bakery in Teranna. Friendly though shy cat here as I got brekky and read the paper. Another 10 km was my next stop at Eaglehawk Neck. I went out to see the dog line where dogs had been stationed across the 100m narrow gap to detect escapees. I still don't see why escapees wouldn't just swim across the narrow bay. Port Arthur exhibits did explain that escapees did better with "escape kits" of items such as: fish hooks, axe, boots, etc. and those items were not always easy to acquire. Just north of Eaglehawk Neck is the Tessellated Pavement, an interesting geologic phenomenon. A sequence of parallel cracks occur in flat rock shelves right along the shore. Differing erosion forces have resulted in two different structures almost side by side: "loafs" occur where the cracks wore away first with deep grooves and "pans" occur where the cracks wore away last leaving raised ridges. Just past Tessellated Pavement the road climbs steeply for a few kms and then descends into Murdunna where I made my next stop. At 41 km was a following stop at Dunalley. It was here that I decided to swap back tires. Back tire #7 had been occasionally rubbing. Extra friction was obnoxious but I was at least as concerned that the paint was wearing from the frame in a way reminiscent of my previous (cracked) frame. Back tire #8 had much more clearance despite the specs being just slightly smaller (700x35 vs 700x38), not clear how exact these sizes are. At 51 km was Copping and another brief stop. There is a gravel back road from here to Orford. Only 46 km vs. 71 km, but it was questionable particularly with recent rains. So I proceeded to Sorell at 71 km. Along the way several longer hills and descents. The Datsun 2000 club had been in Port Arthur so their small sports cars passed yesterday and today. I had taken it easy, but it was still early, so decided to continue to Orford. The route went along some pastures with sheep before suddenly climbing a long hill. I didn't remember it on my trip two years ago! Black Charlie Gap was at 296m. A slight descent, a nice flat run, and then a climb up Bust-Me-Gall Hill at 336m. I remembered this hill and walked a brief stretch. Just past Break-Me-Neck hill a steep descent. Buckland had a nice inn at 106 km. From here the road was level before going into Paradise Gorge. Beautiful though a narrow road with roadwork. Since Sorell there had been frequent log trucks coming from behind and empty log trucks going the other way. Fortunately I didn't have many in the narrowest parts of the gorge or around blind corners (one can hear them as well). Nice to see Orford at base of the gorge. Found a room at the motel and relaxed at end of a slow but long ride. Fellow around-Australia cyclists, Brendan and Wendy, are in this area as well. They made newspaper today with not just leukemia fundraising and awareness, but also because they were married in Richmond this past Sunday! We have been in email contact and I sent two notes with the Datsun 2000 club. I walked around Orford though didn't see them. I suspect our paths will cross as we're both booked on the 27 November ferry from Devonport. 122 km today, 22897 km cumulative.